Let’s Build a Wall Part 3: A Nice Frame to Hang on. 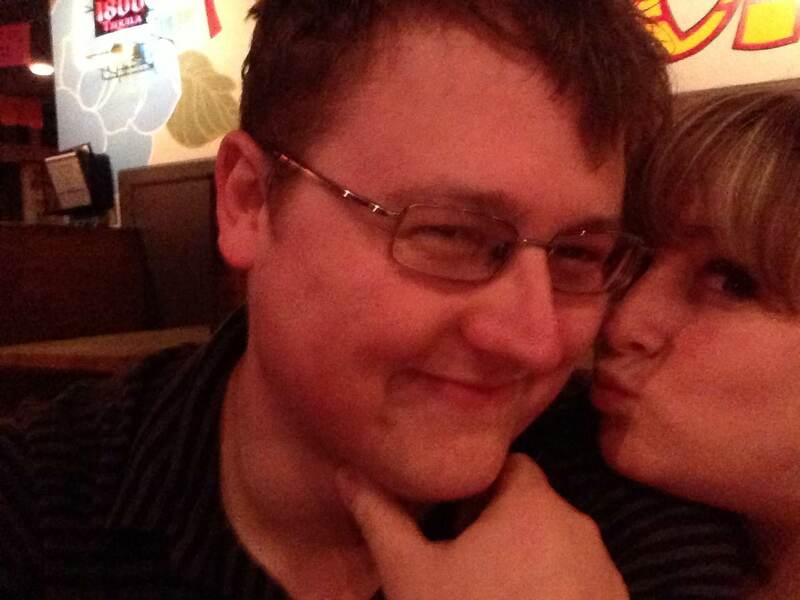 This post is brought to you by the letter B, for Boyfriend. 1. 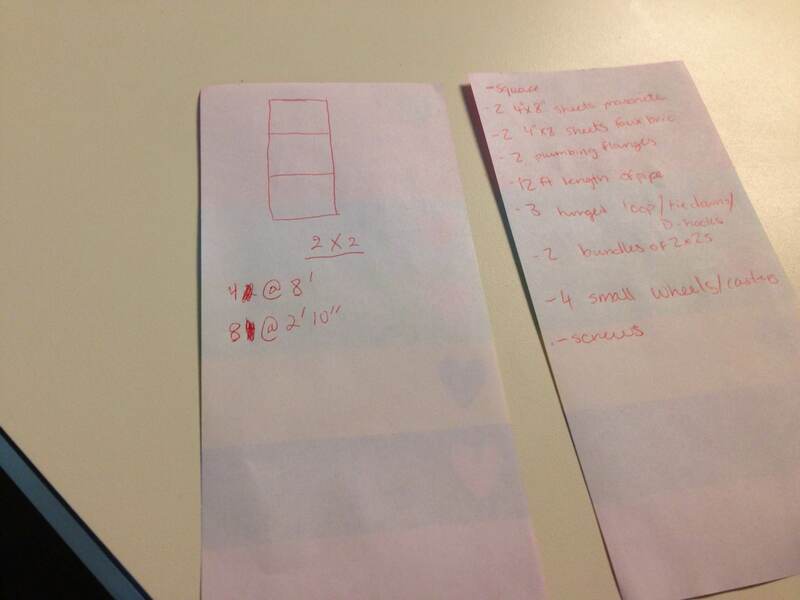 First step is to figure out what size you want your doors to be, height, length and width. 2. Draw a blueprint of the door. Even though it is simple, this step always helps me. 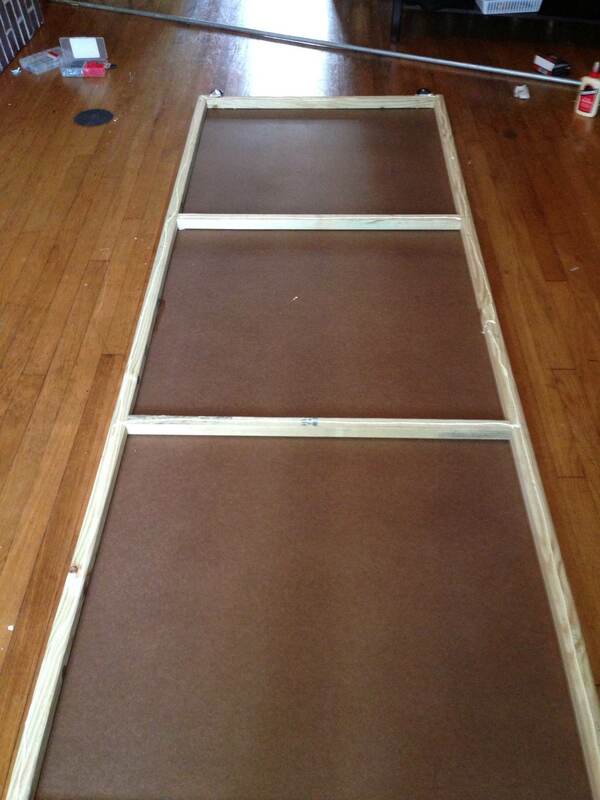 Important: Do NOT forget to account for the width of the wood when drawing out your frame, and measure your masonite so you can assure that you are building it appropriately. Hardware stores materials are typically a bit bigger than they quote on the signs, so you can make a couple of cuts and still get what you are looking for, so ensure the materials you are buying match your desired dimensions. 3. Lay out all the wood and start putting it all together. Use wood glue and the appropriate sized screws or staples, depending on your wood length. We used 2” x 2” wood (which is actally 1 1/2” x 1 1/2”), so 3” drywall screws worked out great. Try to build it as square as possible. 4. It should be relatively stable, but don’t worry if it does not feel overly secure at this time. 5. Apply a layer of glue to the top and lay down the smooth masonite, so you won’t have to look at ugly framing on the backside. 6. Attach using screws/staples, which shouldn’t be terribly big, as the masonite will only be 1/8” -1/4” inch at its thickest. Important: make sure your door is square. The masonite is really what is going to hold this together. Pro tip: when making sure the door is square, start on either the top or the bottom first, and then work your way to the sides. 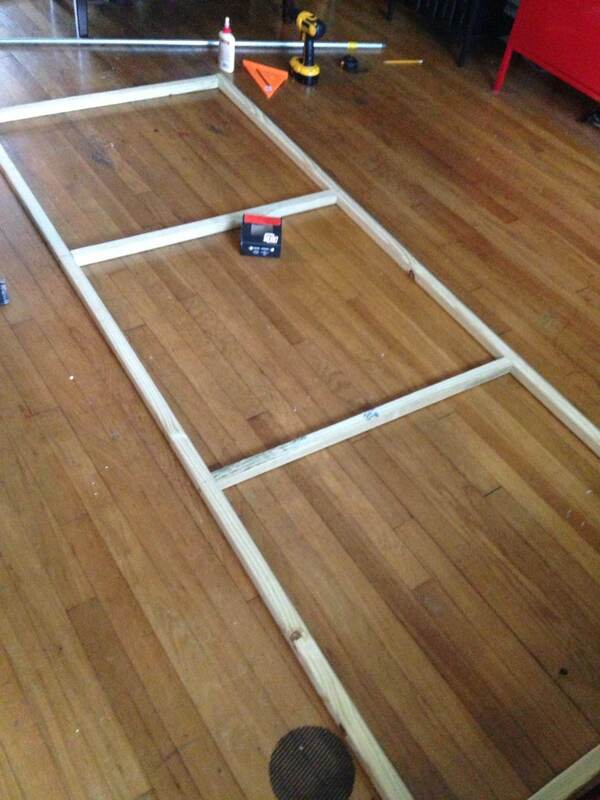 It’s much easier to move your frame to make the door square when you have the length working in your favor. 7. 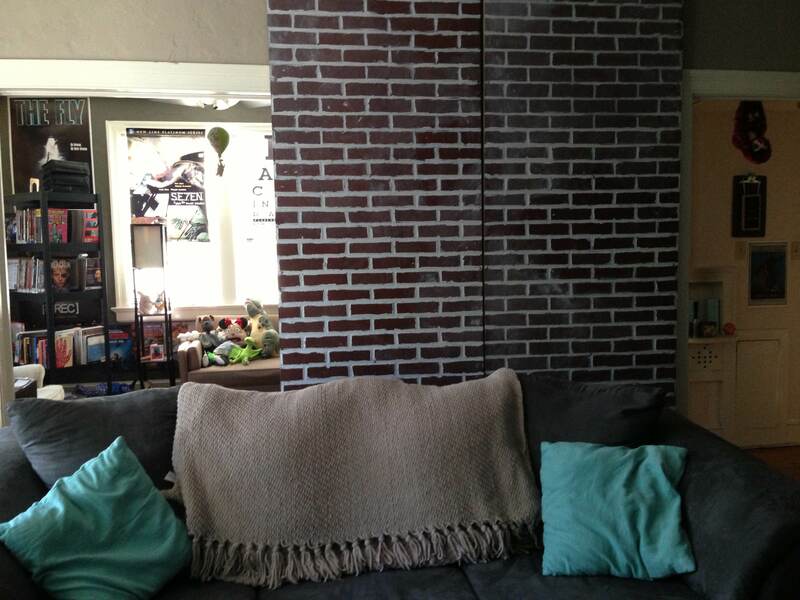 Have your amazing girlfriend distress the brick masonite to make it look super realistic. 8. 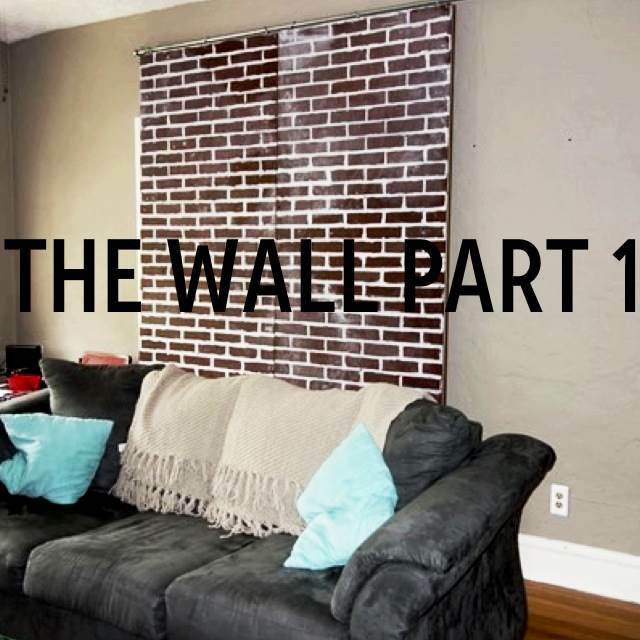 Install the brick masonite on the other side of the frame, taking care to make sure that the bricks will line up as you like it. 9. Install the hardware; the D-rings on the top (3-4 per door, depending on width), the casters on the bottom (2 per door), and any handles that you’re looking for. 10. Insert pipe into D-rings, install elbows and flanges. 11. Screw flanges into wall. Isn’t he great!? He did the big stuff on this project. 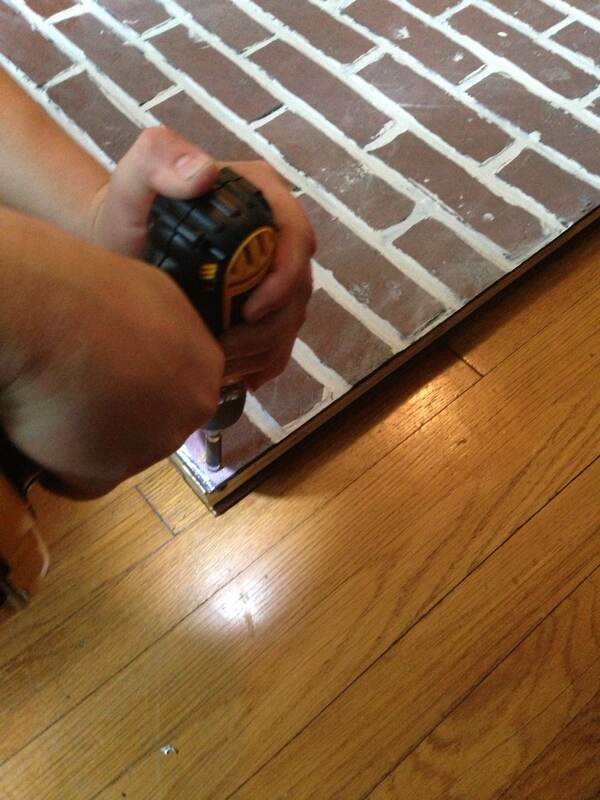 I got to do the brick! But it was a team effort and it paid off! 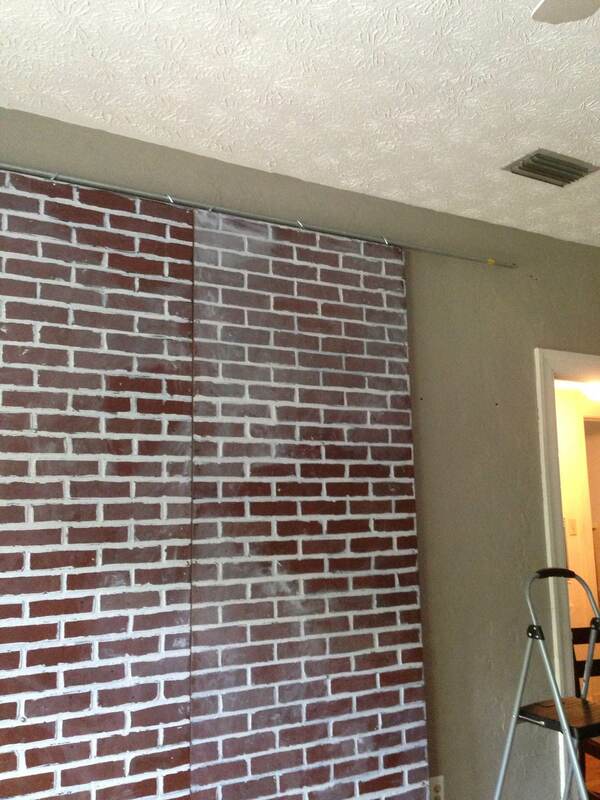 This entry was posted in Projects and tagged Brick, cobras, DIY, Door, Home Depot, John, Lowes, Masonite, Materials and Supplies, Projects, Weekend, Wood on June 20, 2013 by craftycobras. So as promised I worked on a rather large project this weekend. When I was touring my apartment, there was a pair of French doors that were in the opening between the living room and the den. I liked the possibilities we had with those. Well, when I moved in last November the doors were not there. It turns out the people that were living there moved to my landlord’s building next door with the same layout and took the doors with them. So I had a big two door sized opening. That was all well and good, but when we started watching movies in the morning on the weekend the glare on the TV was intense. And thus a project was born. Initially for this project I had a lot of ideas and simple fixes. We’ve been in the apartment long enough that we knew we needed to be able to use that space if we wanted, but block out the sun when we wanted a dark movie atmosphere as well. 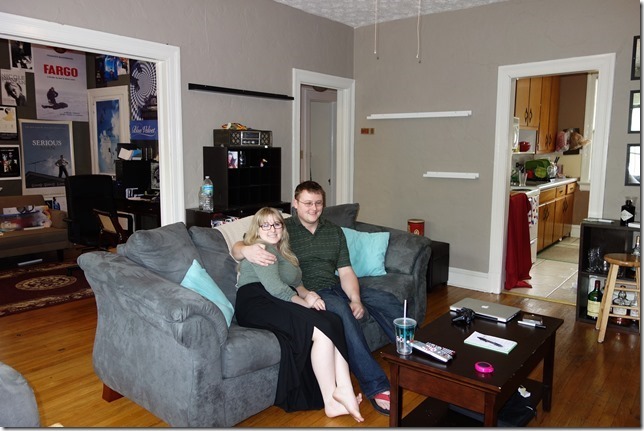 I thought about just getting a tension rod and a set of curtains, but I did that in my apartment in college and the curtains would often get wrinkled, or stay closed for long periods of time and I didn’t think it fit our space. 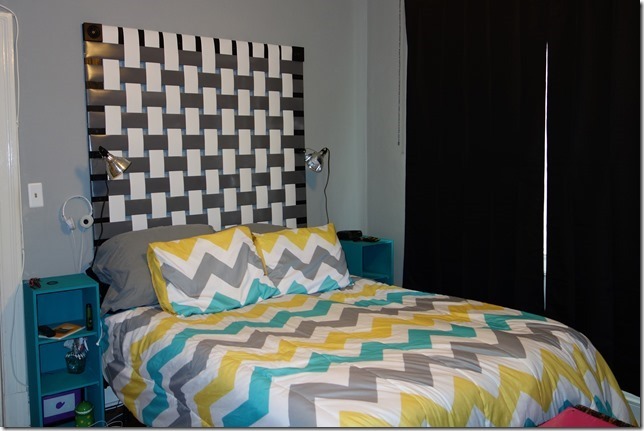 I also thought about using a room divider screen. The problem is those can get expensive and most of them weren’t tall enough. I liked a few but I also felt like I didn’t know where I could store it when we weren’t using the divider. And of course I thought about just recreating the door look all together. But the cheapest doors that would look appropriate in the space were $140.00 each. I understand now why my neighbors held onto theirs. So for a while I was at a standstill, I knew I wanted a way to cover up the opening, but also leave it open. Then I started seeing all these sliding barn door tutorials popping up online. 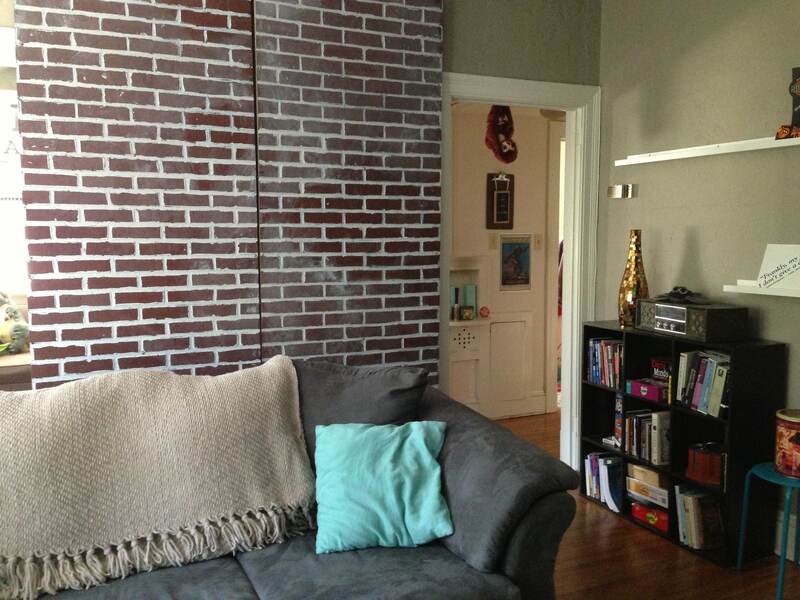 Add that to my love for loft apartments with exposed brick walls and you then have the inspiration I needed. 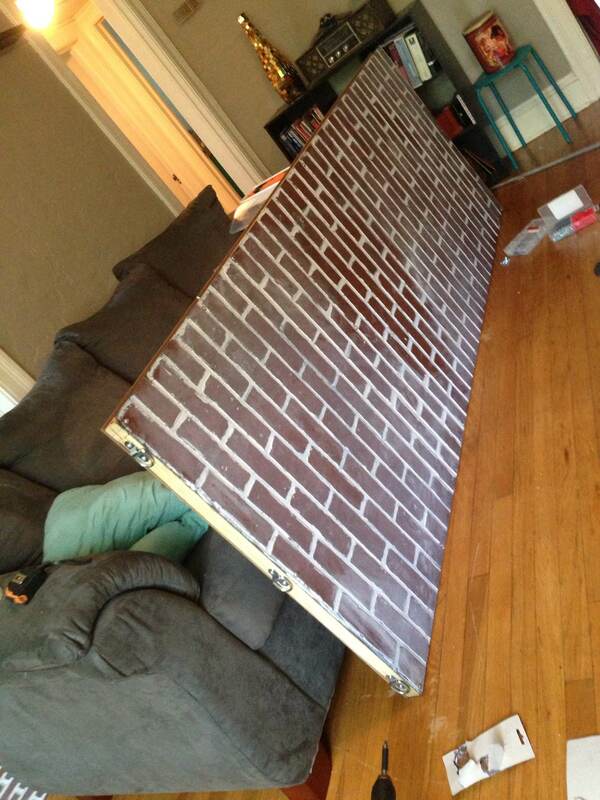 I’m going to make a sliding brick wall. Yep it sounds crazy. And after the amount of work John and I put into it, it is crazy. Now I was inspired by the many bloggers I’ve seen who have made that faithful trip to Lowe’s to buy sheets of faux brick Masonite. And I like them did the exact same thing. But I am an equal opportunity home improvement store shopper so we also went to Home Depot for a number of finishing touches. Now I’m going to show you what this looks like. And if you want to endeavor in this project it is going to be in a few parts because there is a lot going on: distressing brick,building a frame and hanging a sliding barn door. This isn’t the thriftiest project I’ve done either. 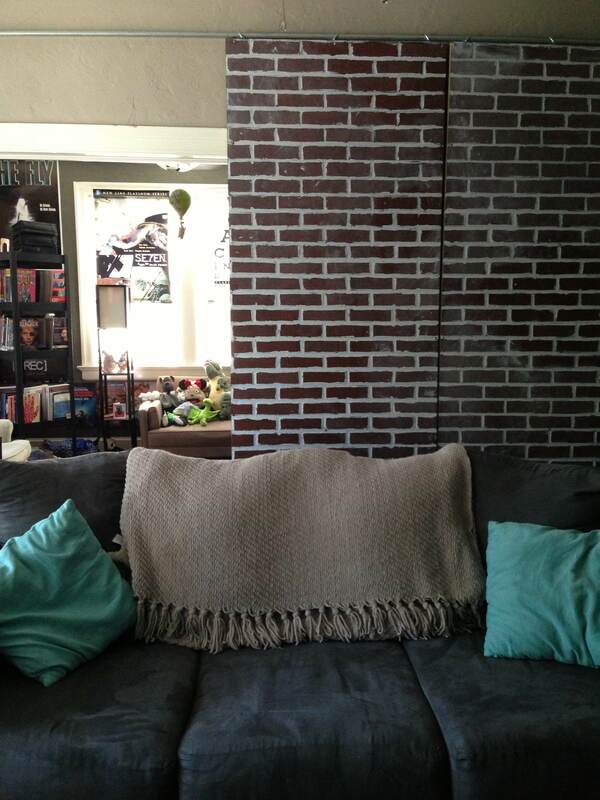 The price for the 2 sheets of brick Masonite, and the regular Masonite cost about 80 dollars. Plus the amount it cost for the other materials was about another 80 so we are looking at a $160 dollar sliding wall project. But if you compare that to the very large price tag on the sliding barn door kit : http://www.amazon.com/NW-Artisan-Hardware-NW-1-Sliding/dp/B00A2BZRZK $230.00 I feel like I saved a little. Plus that track is only 6 feet and mine is 10. And I got to make it brick. So there. The wall closed, before furniture. And this project called attention to how empty those walls are! I’ll be filling those up with art soon! 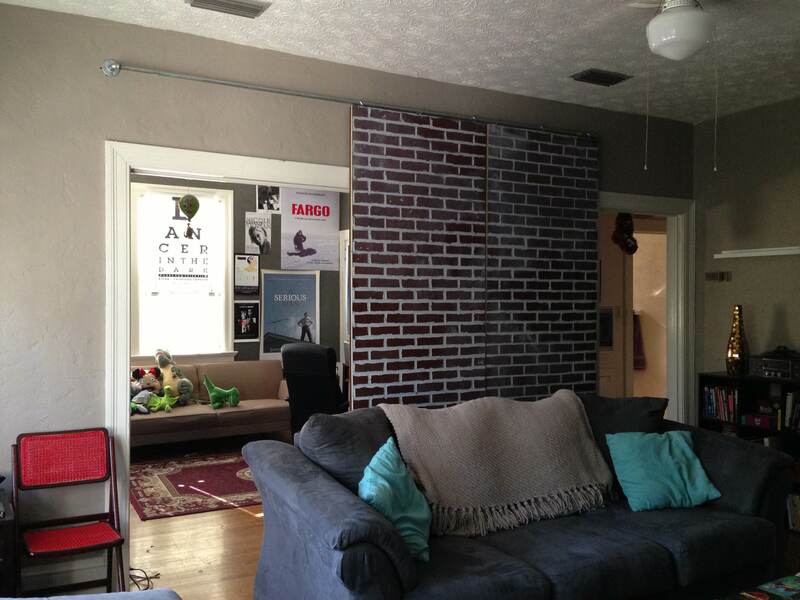 This entry was posted in Projects, Theatre and tagged Apartment, art, barn door, Brick, cobras, DIY, Door, faux brick, Home Depot, living room, Loft, Lowes, Masonite, Painting, Projects, sliding door, Weekend on June 17, 2013 by craftycobras. How bleh bleh bleh! 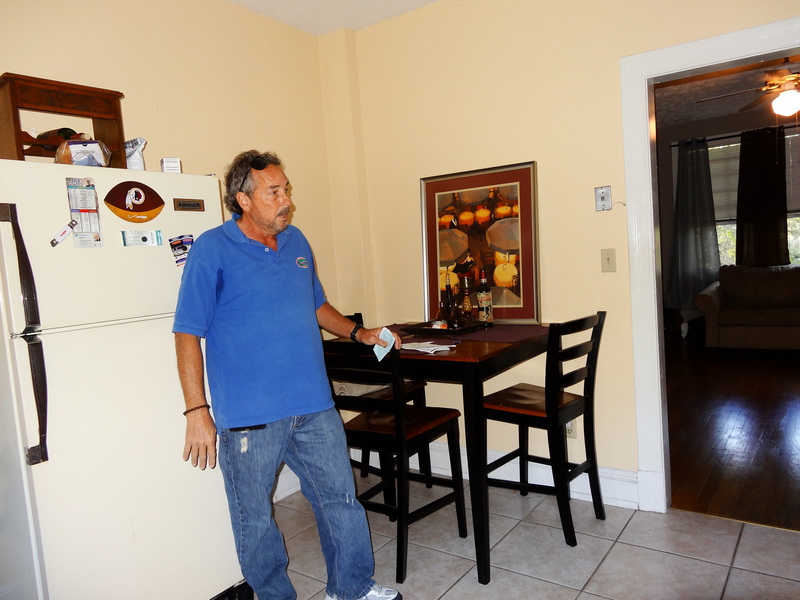 Yellow walls, a very outdated fridge, and not a lot of counter space, but a relatively big room! So I want to tell you a little about my favorite easy solutions to the space. The most important thing to talk about is my landlord. You can see him in the before photo! I truly believe I live in a renters dream. My landlord encourages my projects and actually reimburses me and John for a lot of our materials like paint, tarps, brushes, etc. Yep, I know your jealous. He is the man. So one would think that means carte blanche right? Wrong. He reimburses within reason. If I show up every two weeks with 200 dollars in receipts my crafting days and renting from Mr. Awesome would be over. So I try and find the thriftiest solutions always. 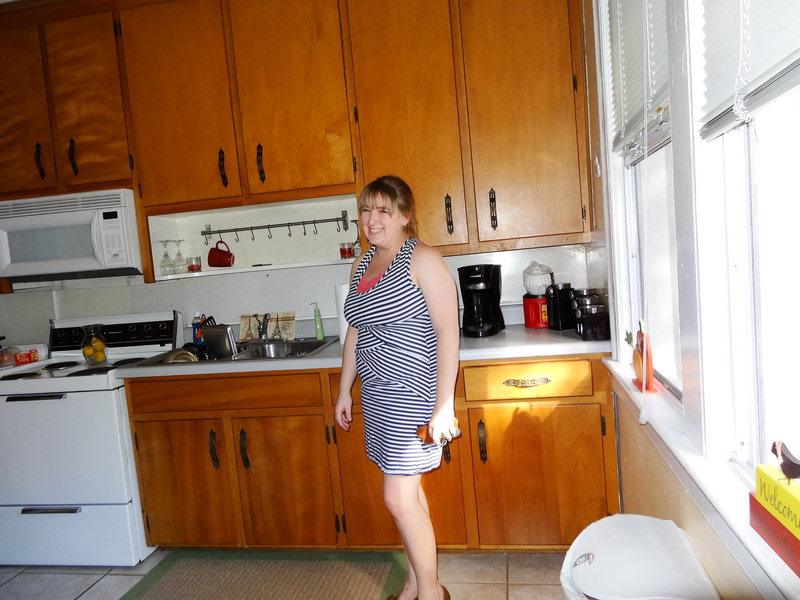 Originally I painted the kitchen brown. I thought I would do this whole coffee color with red accents. Well after a few months living in it I hated it. It did not match the other rooms, and it was sad. So sad that I don’t think I took any pictures of it when it was painted brown. Whoops. Shows how much I really did not like it. I had a great shelf for my kitchen but after a month had still not installed it. And before we did that I just wanted to re-do the whole darn thing. First to go; the awful brown walls. We jumped over to Home Depot and got some white paint as well as 2 quarts of Chalkboard paint. Oh yeah. And 3 rolls of black vinyl contact paper. So the kitchen over haul had begun. We started repainting the walls the wall with the window and the fridge wall were painted white. 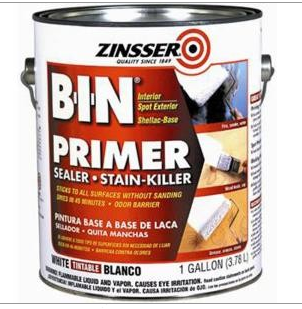 There is nothing a fresh coat of white paint can’t do. I also painted the window sill black. I wanted to give it an awesome pop of color! 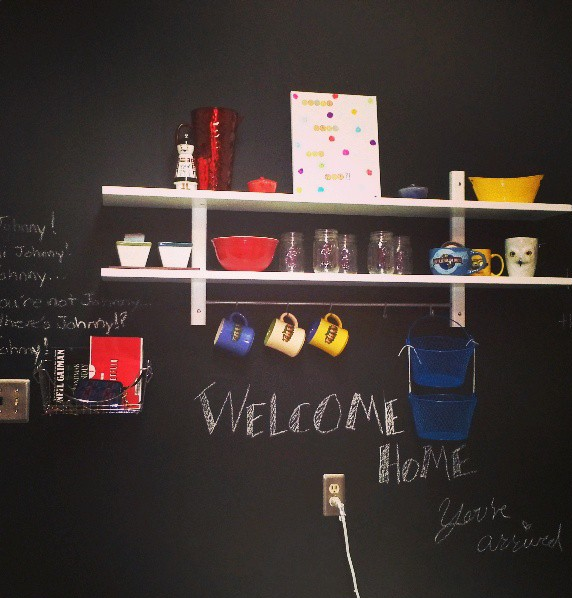 Then the wall with the back door was painted with the chalkboard paint. Then the big project. 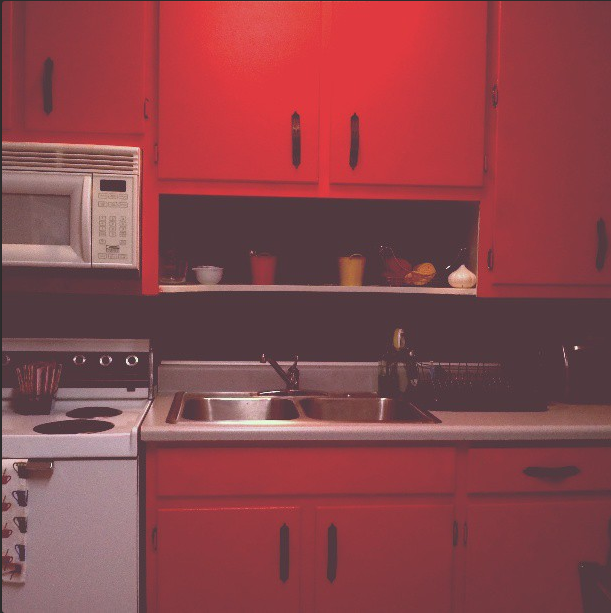 I painted my cabinets. You guessed it Red. And slowly but surely my kitchen became a place I liked to be in again. 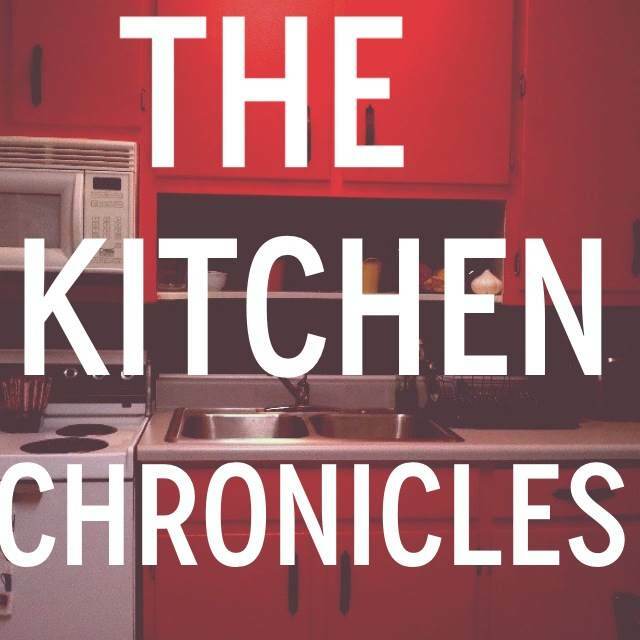 But the most offensive thing in my kitchen was my backsplash… or lack there of. I don’t know if you can see it from those before picture but it’s gross. So contact paper to the rescue! That’s right. I have a contact paper backsplash. 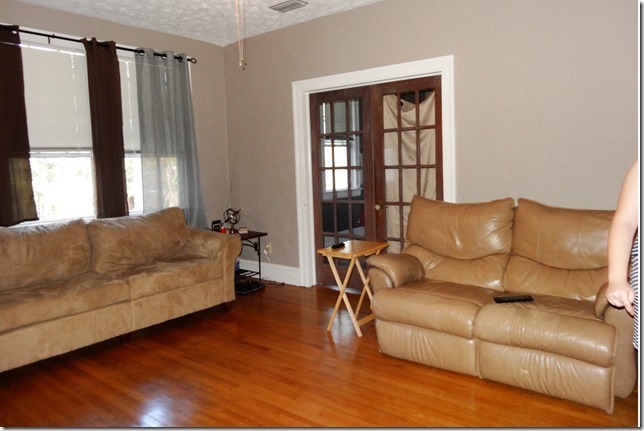 And it’s super easy to clean and totally renter friendly. It is a measure and cut kinda job. Make sure you’ve got a credit card handy so you can smooth out any air bubbles. Pro-Tip: you can also use a pin to pop the bubbles and then you can use the credit card to smooth out the air. Then it was on to decoration. I wanted to have bright primary colors. A trip to the dollar store was in order. I got an awesome amount of towels, little containers, and frames all for the very low price of 1 dollar. I then set out spraying a bunch of frames different primary colors and installing them on my wall. Pictures of that coming soon! And finally after months ( and some pretty decent sized holes and anchors in the wall) I installed the IKEA shelf that I got for the room in the first place. So that’s where my kitchen is today. I really want to do something fabulous with the fridge. It is very old, and to be honest very ugly. This entry was posted in Food, Projects and tagged backsplash, black and white, blue, cabinets, chalkboard paint, cobras, Color, contact paper, crafting, Crafts, DIY, dollar store crafts, dollar tree, Easy, Home Depot, IKEA, Kitchen, love, paint, picture frames, primary colors, primer, red, shelving, Sherwin Williams, Shopping, storage, Weekend, Window, yellow, zinsser on June 11, 2013 by craftycobras. 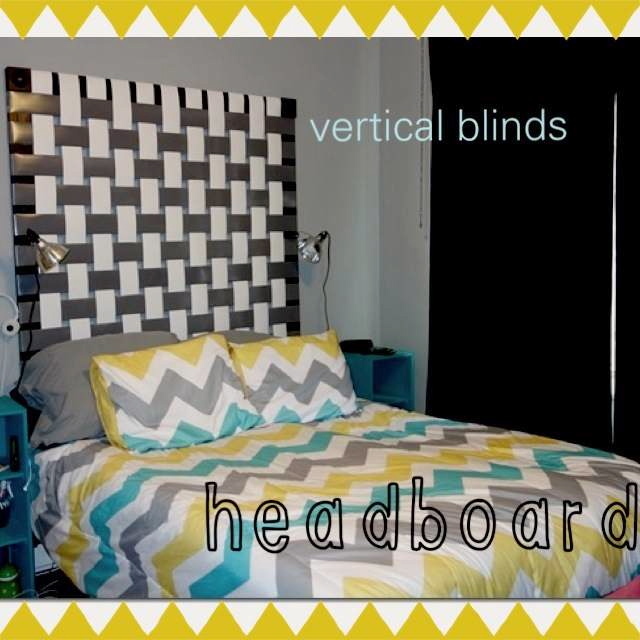 Inspired by the Best Bloggers: Vertical Blinds Headboard! This is my headboard. I’m in love!!! I definitely suggest using her post as the tutorial as we took some serious liberties. We replicated the project before the actual instructions went up so ours was a little different. 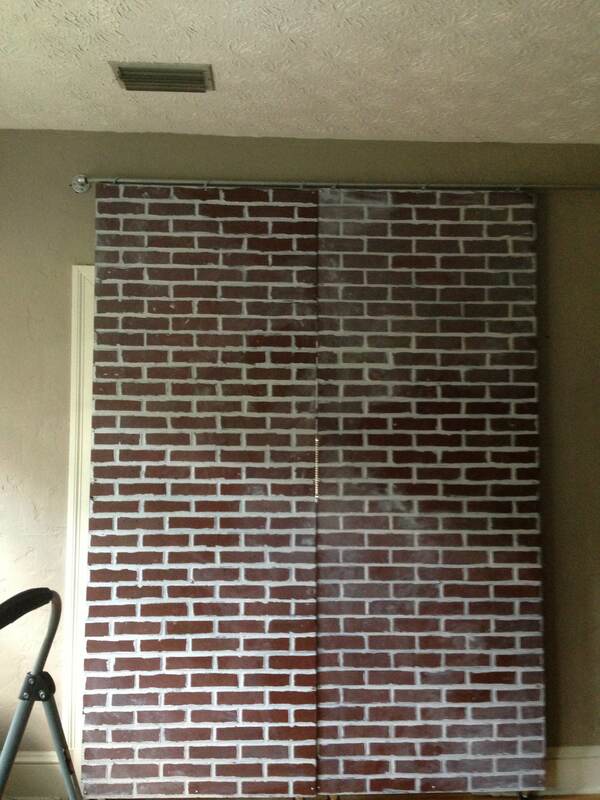 Plus we didn’t use cloth vertical blinds. We used those heavy plastic ones because we like to torture ourselves. We also added some more color to fit our aesthetics. 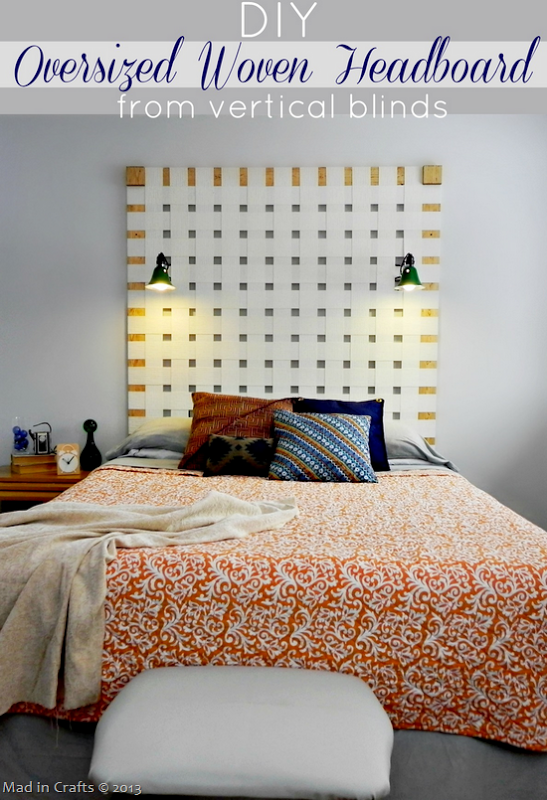 But I really do love the headboard. If you have any questions I’d be happy to answer them in the comments section below. This entry was posted in Projects and tagged bed, bedroom, black and white, Blinds, blogs, cobras, crafting, DIY, do it yourself, headboard, Home and Garden, Home Depot, Lighting, mad in crafts, Painting, Projects, quirk, spray paint, staples, Vertical Blinds, Weekend, Window blind, wood work on June 10, 2013 by craftycobras. 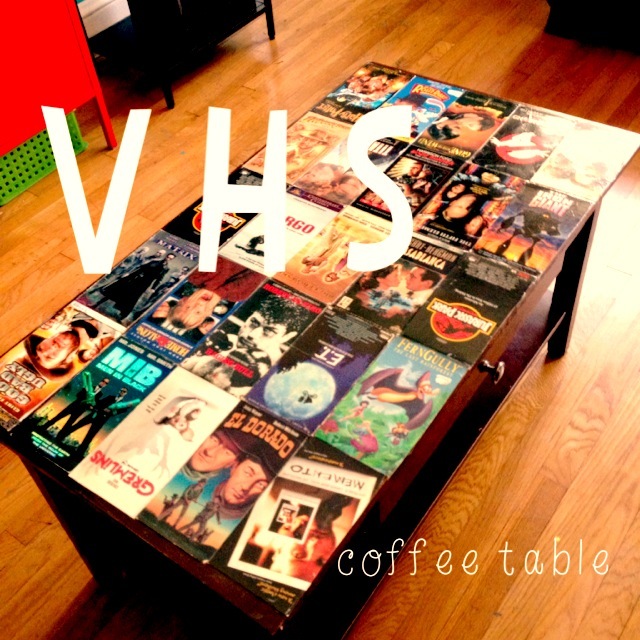 My First Real Project Post: VHS coffee table. I’m going to give you a tutorial on one of my favorite projects to date. I wanted to refinish the top of our coffee table. It was disgust-o grossout. We eat most of our dinners there along with nail painting, and project finishing . So needless to say the table top had scratches, water rings, paint, acetone rings etc. This entry was posted in Movies, Projects and tagged Classics, Coffee table, DIY, Easy, Entertainment, Film, Home Depot, Jurassic Park, Modge Podge, Movies, Polyurethane, Projects, Sandpaper, VHS, Weekend on June 7, 2013 by craftycobras. 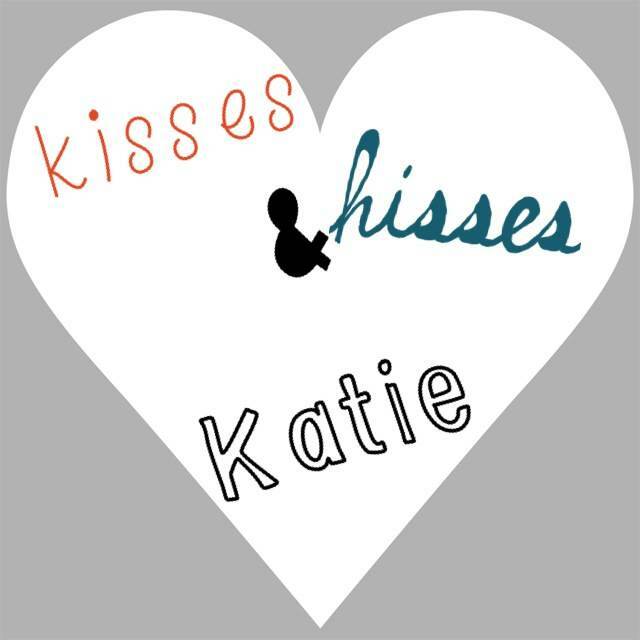 This is a DIY and life blog for crafts, wedding fun, and gifts.